London-based author Michele Kirsch started writing professionally in 1986, specializing in health, parenting and relationship topics. Kirsch has written for "The Times," "The Guardian," "The Observer" and "The Daily Mail," as well as many U.K. lifestyle and health magazines. She has a Bachelor of Science in education from the University of Massachusetts, Boston. When you glance in the mirror in the morning and see dark circles under your eyes, you might presume you have just had a bad night's sleep. The skin under the eyes is very thin, so any alteration in pigmentation is going to show up there. You can solve the problem cosmetically with a variety of cosmetics and potions, but if you have dark circles not only in the morning but most of the time, it's best to get to the bottom of the problem. They might indicate an underlying nutritional deficiency. According to UK-based nutritionist Jane Clarke, one common cause of dark circles under the eyes is iron-deficient anemia. You need enough iron in your diet to manufacture hemoglobin, which carries oxygen to the cells. If your iron levels fall too low, you might experience a variety of symptoms. Dark circles alone do not indicate anemia definitely, but if you are experiencing other symptoms such as fatigue, frequent colds and dizziness, then you need to get your iron levels checked with a complete blood count, provided by your physician. Women are more likely to have iron-deficient anemia because of blood loss during the menstrual cycle. Also, women are more likely to go on calorie-restrictive diets, which might lack essential nutrients such as iron. Good sources of dietary iron include lean red meat, eggs and beans such as kidney beans, black beans, chickpeas and lentils. Dark leafy green vegetables such as spinach, seaweed and soy products are all good sources of dietary iron. The problem is, they need to be bioavailable, meaning that the body can actually absorb and utilize the iron. It is particularly difficult to get all the iron you need purely from vegetarian sources, and even harder from vegan sources. According to Clarke, taking a vitamin C supplement helps your body absorb vegetarian sources of iron. Dark circles under the eyes may be hereditary. Because the skin under the eyes is very thin, when blood passes through the area it can produce a dark color, much like the blue color of your veins. The thinner your skin, the more the circles will be evident. Another cause can be overexposure to the sun. Another much-ignored cause of dark circles is allergies. Itchy eyes, caused by pollen or other allergens can make you rub your eyes more often than you should. Less often, undetected food allergies or intolerance can contribute to dark circles, hypothetically, though there is no hard, scientific evidence to back this up. Natural aging heightens the effect of dark circles with bagginess. 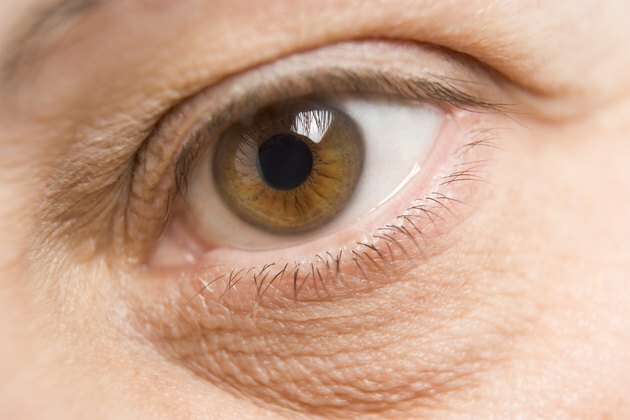 As you age, you lose skin tone and texture and the eyes are generally the first sign. The bags make the dark circles seem more prominent from the folds. Cosmetic procedures might lift the bags, which would lessen the effects of the dark circles, but a good cosmetic cream will at least even out the skin tone, if not actually tighten the bags. Anecdotal evidence suggests that placing raw potatoes, cold tea bags or cold cucumbers under the eyes may provide some relief. Remain hydrated during the day; dehydration can heighten the effects of dark circles. That said, fluid retention can accentuate dark circles with a puffy-eyed look. Water itself does not cause fluid retention, but alcohol, smoking, and lack of sleep all have the potential to create a puffy effect. Consider consulting your dermatologist. According to dermatologist Dr. Jeffrey Benabio, dark circles are the second most common complaint in his patients, after wrinkles. He says the two main reasons are prominent blood vessels in this area and excess pigmentation. The pigmentation can be caused by dermatitis or eczema, which are both treatable. He also advises, as most dermatologists do, to avoid overexposure to the sun and to wear sunscreen every day. Protect-Your-Eyesight.com: Dark Circles Under the Eyes. Do You Have Them? The Dermatology Blog: What Causes Dark Circles Under Your Eyes?